Carrots are in the top five of my favorite vegetables to eat and my number one favorite to grow. There is something so satisfying about harvesting them, sort of the same feeling as opening a birthday present. I never know the size, flavor or even color of the carrot when I start to pull, so it is always a surprise. 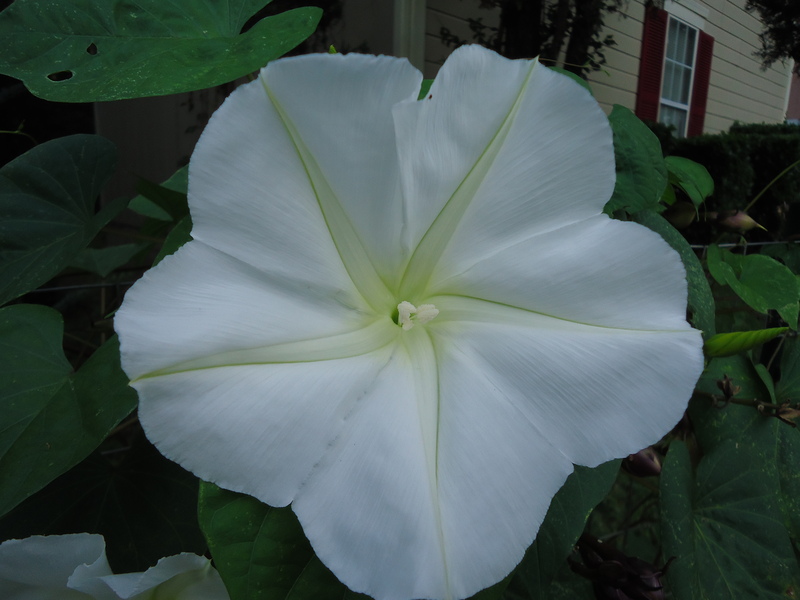 I’ve been growing them in garden beds for six years now. The first year they were horrible, only about an inch long, furry and with a strong bitter flavor. Each year they have been getting a little better as the garden’s soil quality has improved, but I will never have smooth, long store bought looking carrots in garden beds at this house, because there is just too much clay. Here are a few of 2012’s best carrots. 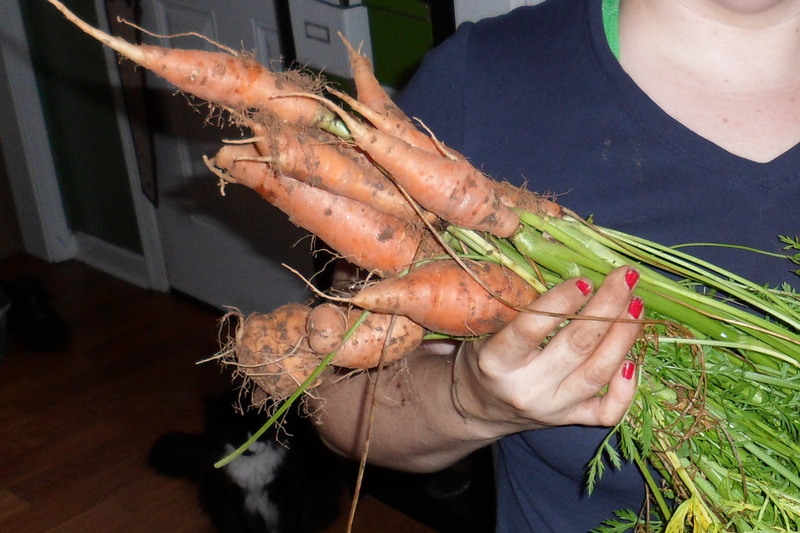 They were a respectable size and the flavor was phenomenal, very sweet and more carroty than you get at the store. Some are a little furry and some were oddly shaped as you can see. Over all these made me happy and I plan to grow more in the garden beds hoping for similar results. This year I am also going to try growing some in a pot and I figured if I am going to have containers in the garden, they might as well be pretty. It is now rather obvious what should be growing in this one. Painting pots is harder in my opinion than canvas (not that I am an expert on either), the top is bigger than the bottom and the whole thing is round of course, not to mention that the smooth surface of the terra cotta does not want to hold onto the paint. I sealed this pot and did two base coats of white acrylic before I started the painting itself. I started on it yesterday afternoon and it took about 3 hours or so of active work start to finish. Having a little art in my garden will certainly brighten things up and make it more fun. Now I have to sift some compost and mix it with peat moss, sand and potash to fill up the and then add the carrot seeds. I have 4 varieties and a mix this year. Since the rabbit is sort of anime I think I will put Asian varieties in the pot, Shin Kuroda and a long thin Japanese Imperial type disappointingly called tendersweet. I will let you know how the carrots turn out in a few months. 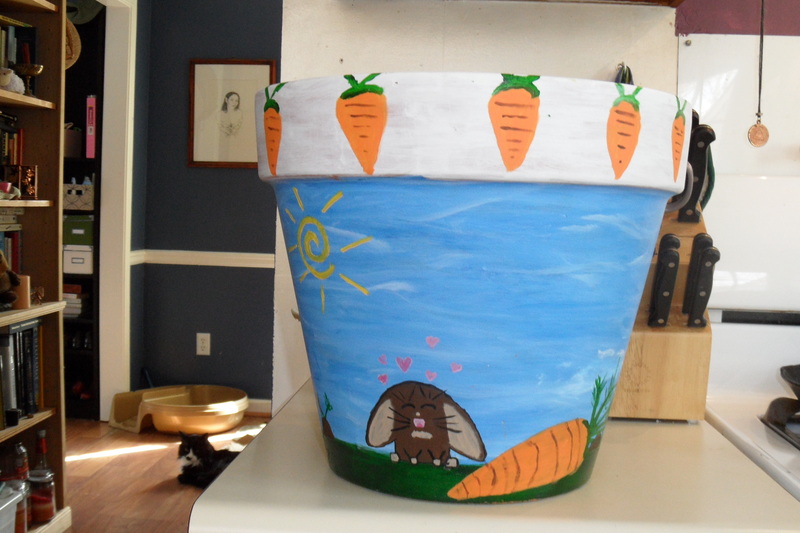 Here is an informative site Carrot Museum if you want to learn everything there is to know about carrots. I try to garden some all year. For example, right now I have a few carrots, onions, chard, and cabbage that are ready to eat. However, the garden looks rather bare. It is not the riot of bright colors that it is in spring and early summer. There are no big pretty flowers, red tomatoes, or high-climbing purple spotted beans. But there will be soon. Yesterday we ordered most of the seeds we will need this year and then planned out where everything is going to go. Looking at the garden plan makes me so excited! We are trying out a few new crops this year: tomatillos, ancho peppers, zapallo del tronco squash, rat tail pod radish, and ground cherries. There are also several new herbs to try out, but they are not on the garden plan yet because I have not decided on placement. Every year the garden gets better and more beautiful. 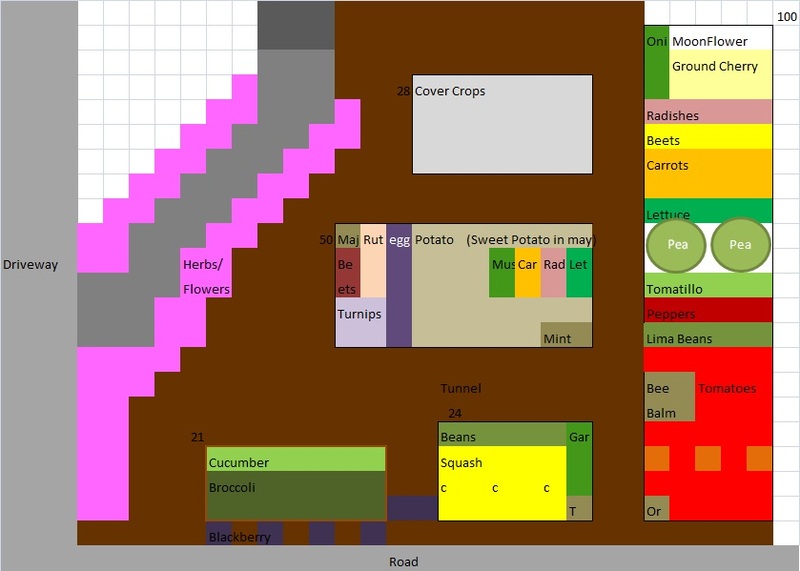 Knowing that soon this garden diagram is going to come alive brightens up these last few weeks of winter. The fall garden is doing well. The star crops right now are jalapenos, radishes, peas and carrots. I don’t really know what to do with many of the jalapenos, I have been putting them in soups mostly. Radishes has been going in anything I think they might work it, salads, cole slaw, roasted veggies. Just this week the peas were big enough to start harvesting and the carrots needed to be thinned so I thought peas and carrots. I regret this decision a little, because my husband has this weird thing were he loves quoting “Forrest Gump” so once I told him we would have peas and carrots, he told me “Jenny and I were like peas and carrots” for the whole day. This is the first time I have ever cooked peas and carrots together as a side dish. They have been together is veggie soup, or chicken and dumplings. I had a bit of a fear of them to be honest. I ate frozen peas and carrot when I was a kid, and it was horrible. For years I would not eat cooked carrots because I was sure they would be nasty. 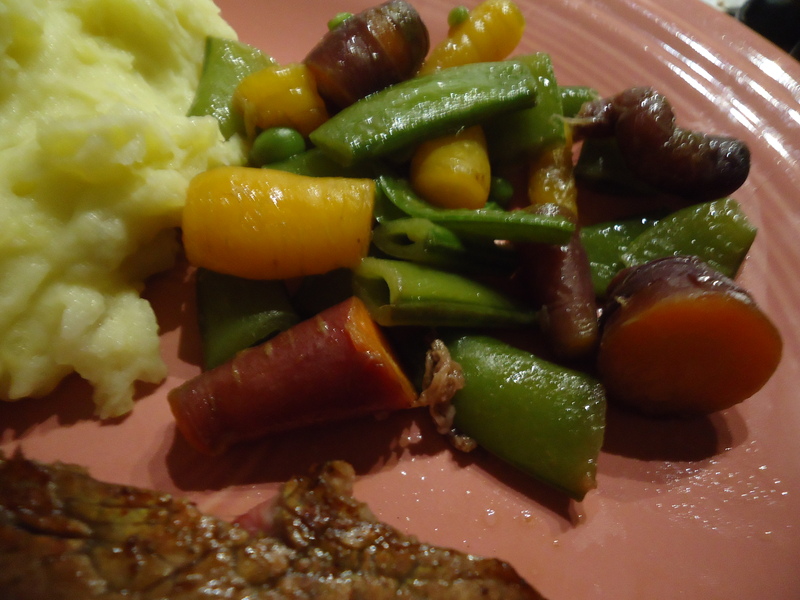 I got over that a few years ago thanks to “honey and ginger glazed carrots”, but when I decided to try cooking pea and carrots together I was a little nervous and it made me feel a bit sick. I know, weird right? I love cooked carrots now, especially fresh ones. And fresh peas from the garden are pretty fool proof delicious. And yet, part of me was afraid that if I put them together some sort of dark magic would happen and they would both become horrible. Thankfully I was wrong. It was delicious. I just cooked them with butter, a bit of water and salt until tender. It was veggie sweet, salty and perfect. I will not have enough peas again for about a week, and carrots might be longer. But as soon as I can harvest them both at the same time again, this is going to happen again. 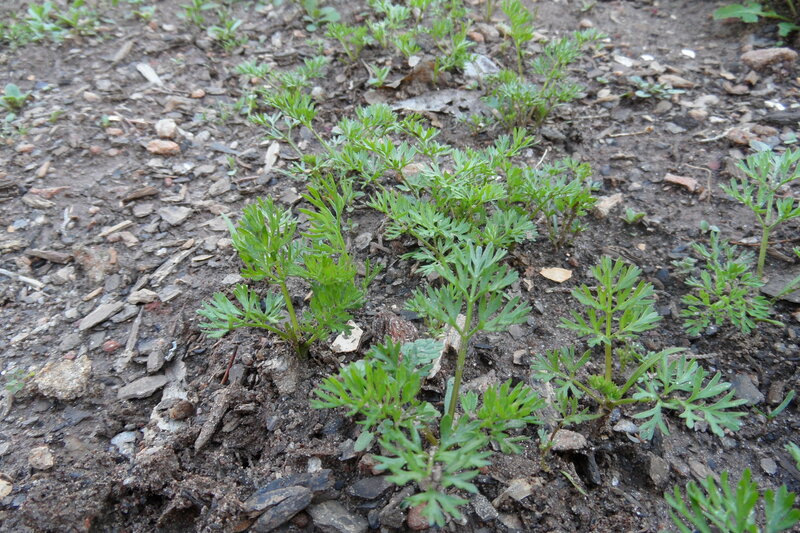 I planted more carrots on Sunday with the hopes that I will have carrots to eat all winter. Peas of course will die at the first frost unless I can make a cold frame or something for them. This is the second year I have tried to grow food all though the winter. It is nice to always have something out there. Makes me feel quite self-reliant. I have several goals when gardening. I want it to be pretty, easy to work with, not to time intensive, cheap and attract fun bugs. But the most important goal however is I want lots of food to eat. I try to grow plants in such a way that I have the maximum number of healthy, high yield plants in the smallest space possible. In order to do this I used biointensive methods (http://www.growbiointensive.org), raised beds, compost, natural fertilizers and companion planting. Companion planting is when you plant two or more different types of plants together so that the properties of one can be beneficial to the other. Like perhaps one plant is prone to a bad bug that is going to eat it all up, but there is another plant that the bad bug hates the smell of. You put these two plants together in one area and they help each other. You can use this method to repel bad bug, attract good bugs, make use of shade, manage nutrients, give structure and protect against disease. This year I have been the most successful I have ever been by using the most time tested method I know, The Three Sisters (http://en.wikipedia.org/wiki/Three_Sisters_(agriculture)). 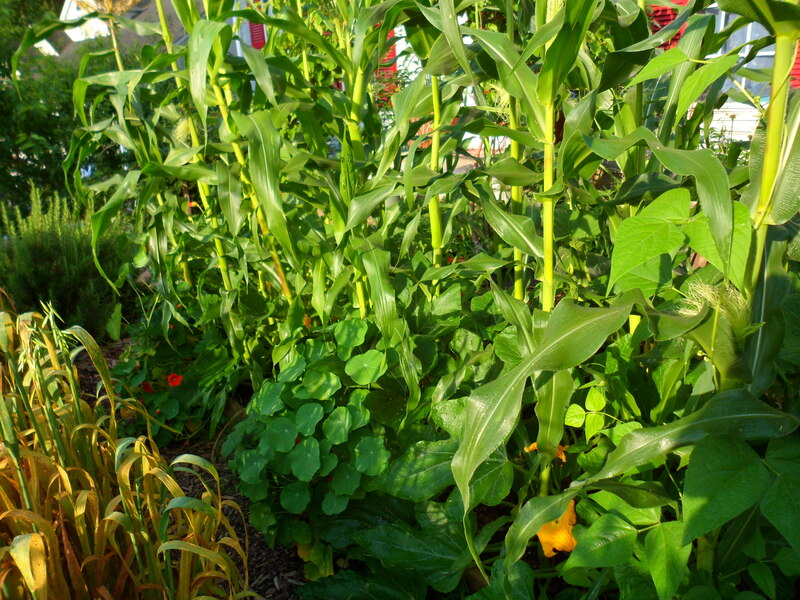 The idea here is that corn need to be spaced a bit away from other corn in order to have room to grow and nutrients. Corn also needs lots of water. 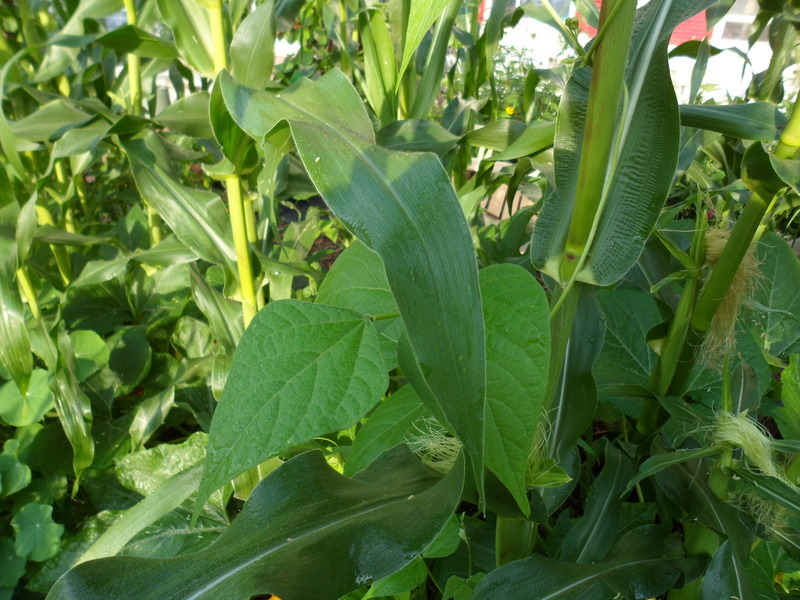 The leaves of the maize plant are not good at creating a canopy and shading the soil. So if you plant corn alone you will have to water it all the time. This is where the squash is helpful, squash stays much lower to the ground than corn, and has gigantic leaves. If you plant your corn and squash together correctly then very little light will ever touch the ground, so no evaporation. Added bonus, no light means few weeds. Corn is also a heavy feeder, it loves to gobble up nitrogen. Beans have this neat bacteria, rhizobia, which hangs out in the nodules of its roots. Rhizobia produces nitrogen compounds. This is called nitrogen fixing, you should look it up if you want more info. So now there is extra nitrogen and the corn says “nom nom nom”. Beans like to climb up other things, and the corn makes a perfect structure for them to climb on. You also see a few pretty red/orange flowers and lily pad looking leaves in here. That is nasturtium, which is a lovely flower that I heard helps squash. I have not actually looked into this, so it may or may not be true. I just really like this flower so I am going to pretend it helps even if it doesn’t. It does help fill in any gaps to the canopy that the squash might miss. In the last month I have not watered this bed. We have been getting rain about once a week, and in a bed with this much canopy that is all you need. But here is the best part. Lets say your corn packets says each seed needs to be planted 12 inches apart. I take that to mean from other corn not other plants. So the first thing I do is lay all the corn seeds out in a honey comb. The first row all of them 12 inches apart, the second row is 6 inches away with each seed being in the center of where the last row seeds were, next row 6 inches away lining up with the first seeds. After that I put in a few squash seeds. Once the corn is up, I plant the beans about an inch away. The nasturtium is planted along the edge.So, to sum up. You have squash on the ground, corn straight up and beans on the corn. Using this method I can harvest a massive amount of food from a tiny space. The bed in these pictures is 28 square feet. Planted in this bed right now I have 30 stalks of corn, 5 large squash plants, 5 nasturtium and about 20 bean plants (should have been 30, but some did not get enough light and did not thrive). This garden bed is about the size of a queen sized sleeping bed. That is not very big at all. Being conservative this season I should get about 90 ears of corn, 150 lb of squash, 75 lb of beans. Do you companion plant? Tell me your favorite combos.